Thought I would share some more images from my summer 2016 trip to the Orkneys. 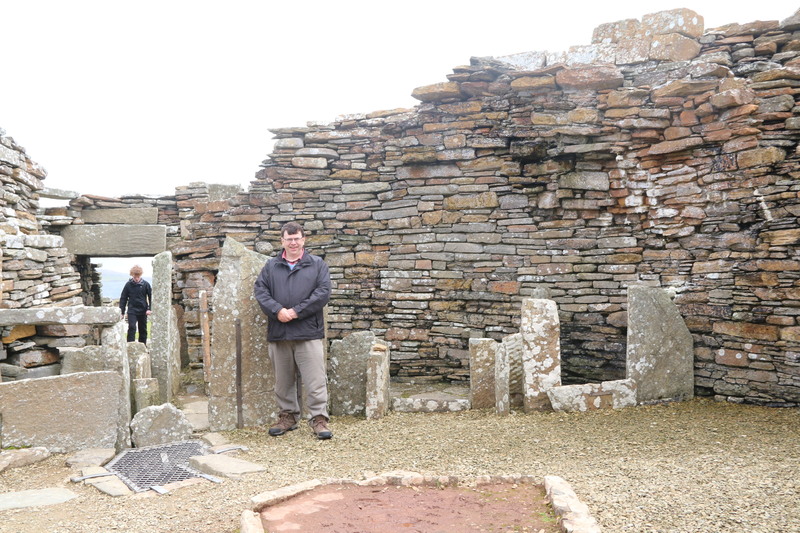 My recent posts have focused on the stone age sites on Orkney. 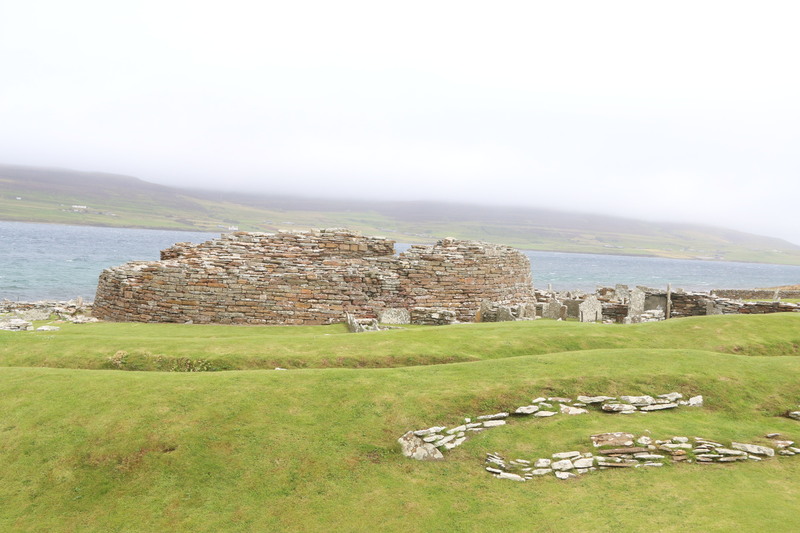 Today I change the era and take a look at The Broch of Gurness. 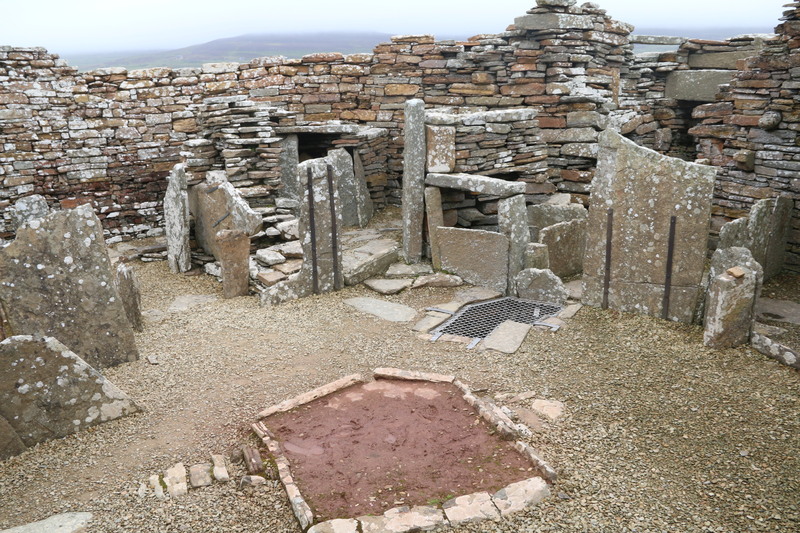 The Broch of Gurness is an Iron Age broch village on the northwest coast of Mainland Orkney. 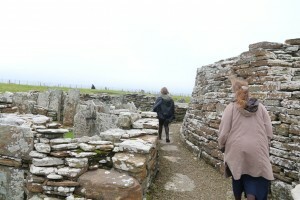 It is thought to have been inhabited for perhaps 3 or 4 or centuries from about 200 BC onwards. Come explore the place with me. The word Broch is a Scots term meaning fort. They are a peculiarly Scottish structure and found pretty much no where else. 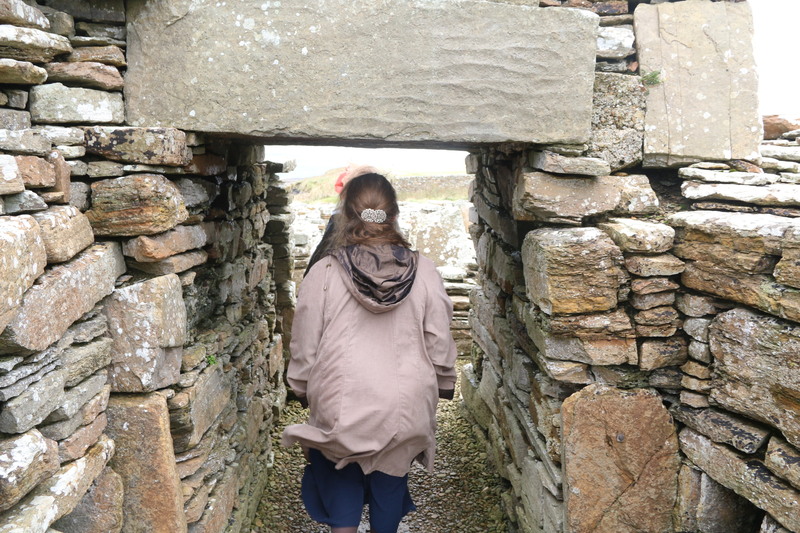 They are stone round houses from the Iron Age circa 500 BC to 250 AD. The distribution of brochs is centered on northern Scotland with a predominance in Caithness and the Isles. 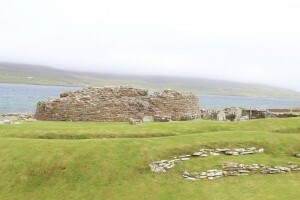 The Broch of Gurness is thought to have been built circa 200 to 50 BC. 1st century Roman pottery has been found there. Curiously there is a historical reference to contact between a King of Orkney and Emperor Claudius. Could that king have once lived here? 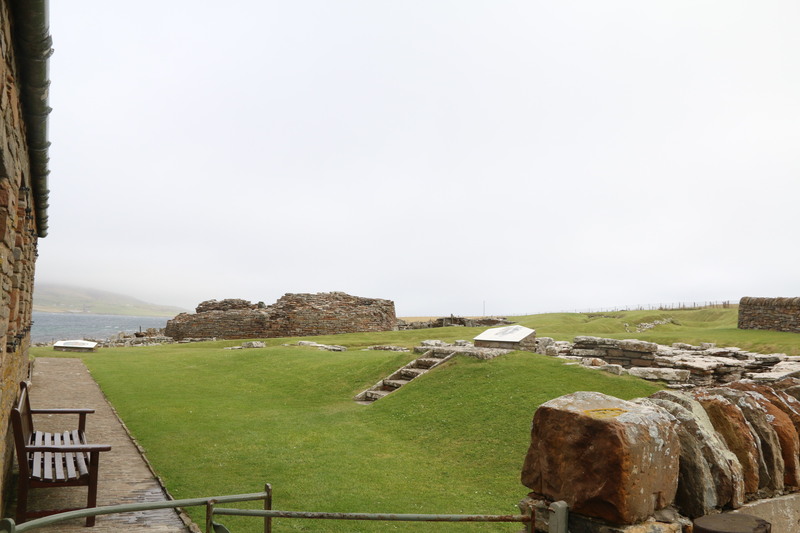 The site was used for several centuries until eventually the central fort was abandoned and in time the site was merely a farm by the 8th century and later a burial site. 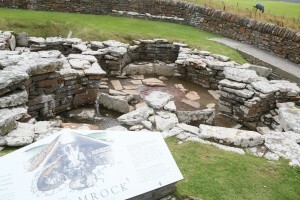 The iconic feature of a broch is the central stone roundhouse. 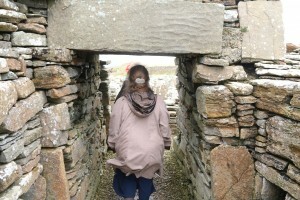 This has hollow walls usually in which are built stairs to a higher level. A wooden floor above ground level would have allowed for more accommodation – bed rooms etc. The outer part of the fortress (outside the round house) was divided into smaller dwellings, workshops and storage areas. 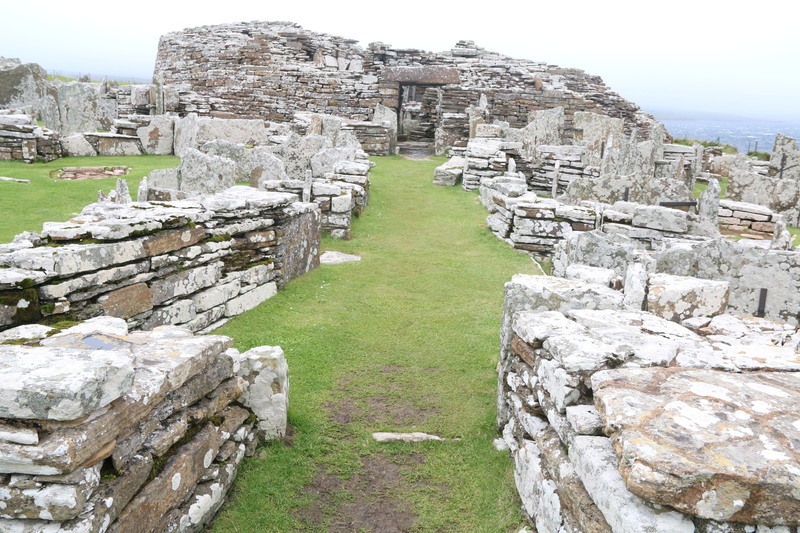 The broch was approached through a central (defendable) doorway and passage that would be difficult to storm. 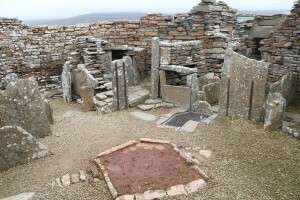 At the heart was a central chamber – a gathering place for the inhabitants with a hearth to warm them on those cold winter nights. Around this are smaller rooms. The site is surrounded by three ditches cut to the bedrock and stone ramparts. 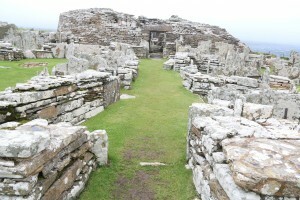 The site is 45 metres diameter. Within the ramparts are the remains of numerous small stone dwellings, yards and sheds. There is a small museum on the site with helpful information and even a small quern or hand mill you can try yourself.